Website is under (re)construction !! Much has been added, and more follows. All cartoonists that have published aviation cartoons in one of my books will have their own page, with biography and sample cartoons. 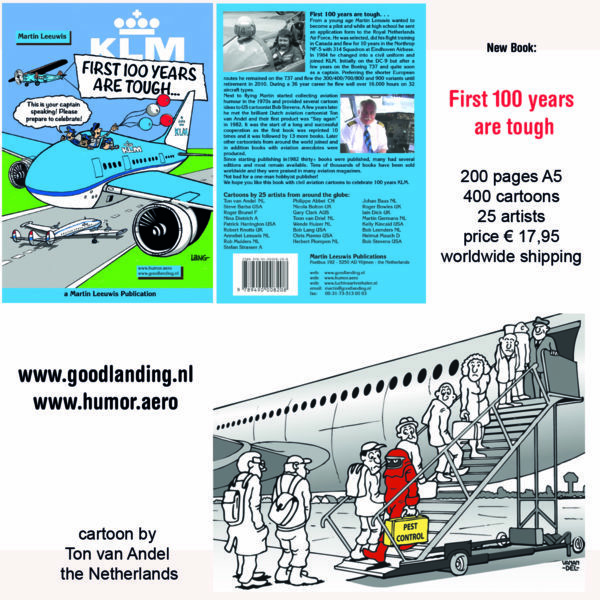 The main new item on website is a fresh new book “First 100 years are tough…” It contains cartoons by 25 artists from all corners of the world and the subject of the cartoons is 100 years of civil aviation and KLM. Triggered by the upcoming 100 years in business under the same name by KLM. Book has been published early November 2018 and is available worldwide, it has 200 pages, size A5 and is full colour.